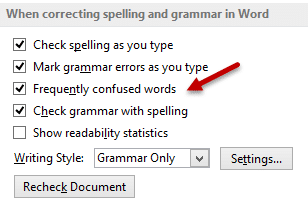 The blue wavy line in Word can mean one of the two things. 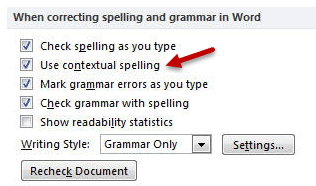 It is Contextual Spelling Errors and other one is called Formatting Inconsistencies. It sounds complex but it is really a very useful feature. It simply checks where you have used the right word in the wrong place. Sometimes, we make these mistakes. In the first sentence, instead of a question mark, a period was used. In the second case, the spelling of LOOSE is right, but it is used in the wrong place – or wrong context. Technically these are called HOMONYMS – words with different spelling but same pronunciation. Regular grammar checker does not catch that mistake. But this one does. This feature is available from Office 2007 onwards. However, if your PC has less than 1 GB memory, this feature is inactive by default. Why so? Because, this feature requires lot of processing power and memory. If your PC has less memory, it may slow down your work. That is why it is automatically disabled. How to activate this great feature? Office 2013 – see what Microsoft did? Microsoft programmers realized that people do not understand the phrase Use Contextual Spelling. So you know what they did in Office 2013? They just simplified the description … have a look. In the next article we will explore Formatting Inconsistencies.